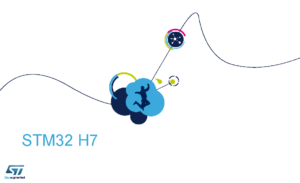 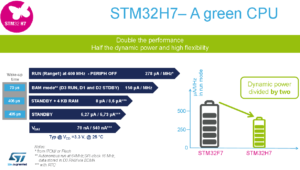 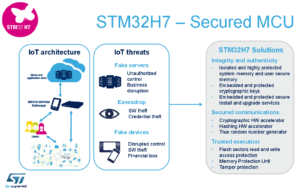 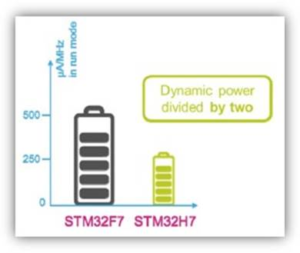 STM32H7 series of very high-performance MCUs with ARM® Cortex®-M7 core with almost double the power efficiency of the Cortex-M4. 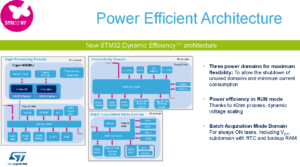 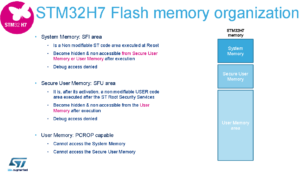 Taking advantage of an L1 cache, STM32H7 devices deliver the maximum theoretical performance of the Cortex-M7 core, regardless if code is executed from embedded Flash or external memory: 2010 CoreMark /856 DMIPS at 400 MHz fCPU. 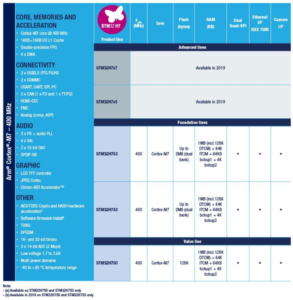 It features a 6-stage superscalar pipeline with branch prediction and an optional floating-point (FPU) unit capable of single-precision and optionally double-precision operations. 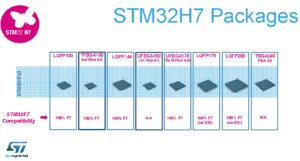 Thanks to 40 nm it is also decreased the consumption compared to the STM32F7 family (Cortex-M7 200MHz in 90nm technology), see below.